Fabric to line the bag if you want to. Chain (Ch), Double Crochet (DC), Half Treble (HTr), Back Post Treble (BPTr), Front Post Treble (FPTr). BPTr and FPTr are made in the same way as a normal Treble but going around the post of the stitch (either from the front or back) rather than into the top of the stitch. The bag can be made to any size you like; it can be made all in the larger basket weave that the bulk of my bag is made in or with the added panel of smaller weave. The foundation chain you make will determine the size of the larger basket weave section. If you are making a smaller or larger bag than mine the foundation chain must be in multiples of 6 plus 3. When making the weave section (Row 7 – Row 11) the next row will always start with the opposite stitch to that of the last row (i.e. if the last section you made on the previous row was FPTr, the first section of the next row will be BPTr). This will then change for Row 12 but it should all make sense as you go and see the pattern that the fabric is making. Row 1 - Chain 93. Starting in second chain from hook, 1 DC in each chain across (92 DC) Ch1, turn. Row 2 – 1 HTr in next Stitch, Ch1, 1 BPTr in each stitch across until 1 Stitch remains, 1 HTr in the next stitch, Ch 1, turn. Row 3 – 1 HTr in next HTr, Ch1, 1 FPTr in each stitch across until 1 Stitch remains, 1 HTr in the next Stitch, Ch1, turn. Row 7 – 1 HTr in next HTr, Ch1, *1 BPTr in each of the next 6 stitches, 1 FPTr in each of the next 6 stitches* repeat across the row until 1 stitch remains, 1 HTr in the next stitch, Ch1, turn. Row 8 – 1 HTr in next HTr, Ch1, *1 FPTr in each of the next 6 stitches, 1 BPTr in each of the next 6 stitches* repeat across the row until 1 stitch remains, 1 HTr in the next stitch, Ch1, turn. Row 12 - 1 HTr in next HTr, Ch1, *1 FPTr in each of the next 6 stitches, 1 BPTr in each of the next 6 stitches* repeat across the row until 1 stitch remains, 1 HTr in the next stitch, Ch1, turn. Row 13 - 1 HTr in next HTr, Ch1, *1 BPTr in each of the next 6 stitches, 1 FPTr in each of the next 6 stitches* repeat across the row until 1 stitch remains, 1 HTr in the next stitch, Ch1, turn. Repeat from Row 7 to Row 16 three more times – This is 8 ‘weave’ repeats in total. Fasten off. Row 1 - Chain 21. Starting in second chain from hook, 1 DC in each chain across (20 DC) Ch1, turn. Row 2 – 1 HTr in next Stitch, Ch1, 1 BPTr in each stitch across until 1 Stitch remains, 1 HTr in the next stitch, chain 1, turn. Row 7 – 1 HTr in next HTr, Ch1, * BPTr in next stitch, FPTr in next stitch* repeat across until 1 Stitch remains, 1 HTr in the next stitch, Ch1, turn. Row 8 – 1 HTr in next HTr, Ch1 * FPTr in next stitch, BPTr in next stitch* repeat across until 1 stitch remains, 1 HTr in the next stitch, Ch1, turn. Repeat Row 7 and Row 8 until 33 rows of the ‘weave’ have been made. Fasten off. These are made in the same way as the Small Weave Panel but with a smaller starting Chain. Row 1 - Chain 9. Starting in second chain from hook, 1 DC in each chain across (8 DC) Ch1, turn. Repeat Row 7 and Row 8 until 40 rows of the ‘weave’ have been made, or the strap is as long as you want. To finish the end of the strap off do 5 rows of ribbing (as with the first 5 rows of the strap), making sure that you start with the correct row - either BPTr of FPTr, so that both ends of the strap match. Sew the Small Weave Panel to both sides of the larger weave panel, making sure that it is the right way around (so that the ribbing across the top is all going the same way). Sew the straps on as in the picture below and line the bag with fabric if you wish. 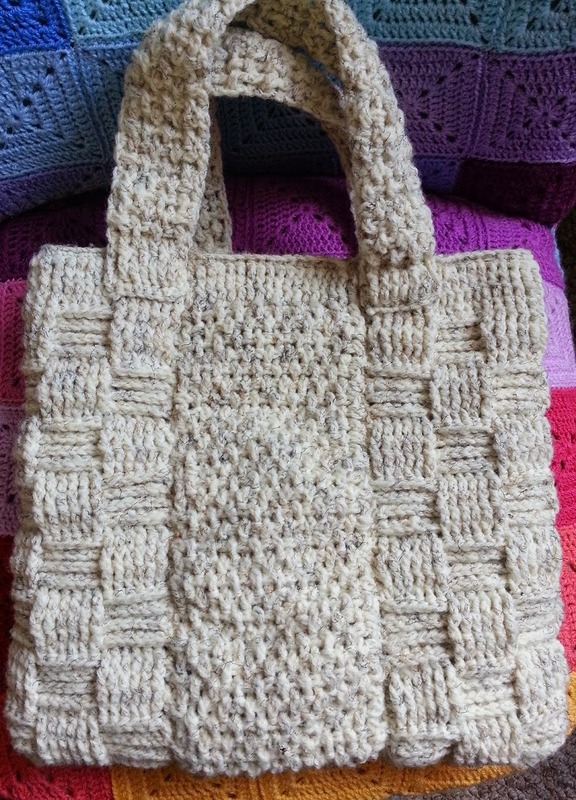 There you have it, your own Basket Weave Tote bag! I do hope you have enjoyed making this bag, please let me know if there are any errors with the pattern or if you need any help at all, leave me a comment and I will do my very best to assist.